Welcome to The Raleigh Rickshaw Co. 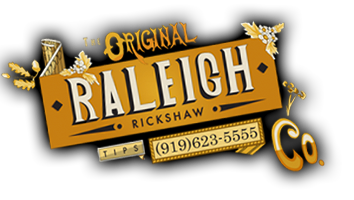 Since April 2007, The Raleigh Rickshaw Company has become an iconic part of the local culture and has established itself as the premier pedal-powered service in Raleigh, North Carolina. Our rides are popular among tourists and locals alike, with both children and adults, to service destinations too near to drive, but too far to walk, while recommending the local restaurants, entertainment, and scenery. This is our General Transportation services, and you can access our services by calling our dispatch line, or use our web services to Get a Ride Now, or Reserve a Ride for Later. In addition to General Transportation, we also offer packages for Weddings, Anniversaries, Romantic rides for two and Corporate Events. As a part of Downtown Raleigh's landscape, our goal is to provide customers with safe, friendly, and comfortable service, creating lasting memories from an entertaining experience. We call this "Transportainment". As the Triangle's only Rickshaw Company, our unique brand combines environmentally responsible transportation with the luxuries and entertainment of a carriage ride and the one-on-one service of a personal concierge. Our general Transportaion services are brought to you for "Tips Only"! That's right: our drivers work only for tips! Our fleet includes Dozens of Rickshaws in Downtown Raleigh, our famous Coffeeshaw and a back-lit Billboard Bike.